Until recent decades the minting of a silver crown piece was regarded as one of the surest signs of national sovereignty. This was certainly the case in the 18th Century, and it was with great anticipation that the infant United States Mint prepared to strike silver dollars in the fall of 1794. No silver or gold coins had been issued up to that point, because neither the coiner nor the assayer could meet their security bonds. When the amounts of these bonds were lowered by Congress, benefactors stepped forth to post them on behalf of the Mint's officers, and the coining of precious metals could proceed. 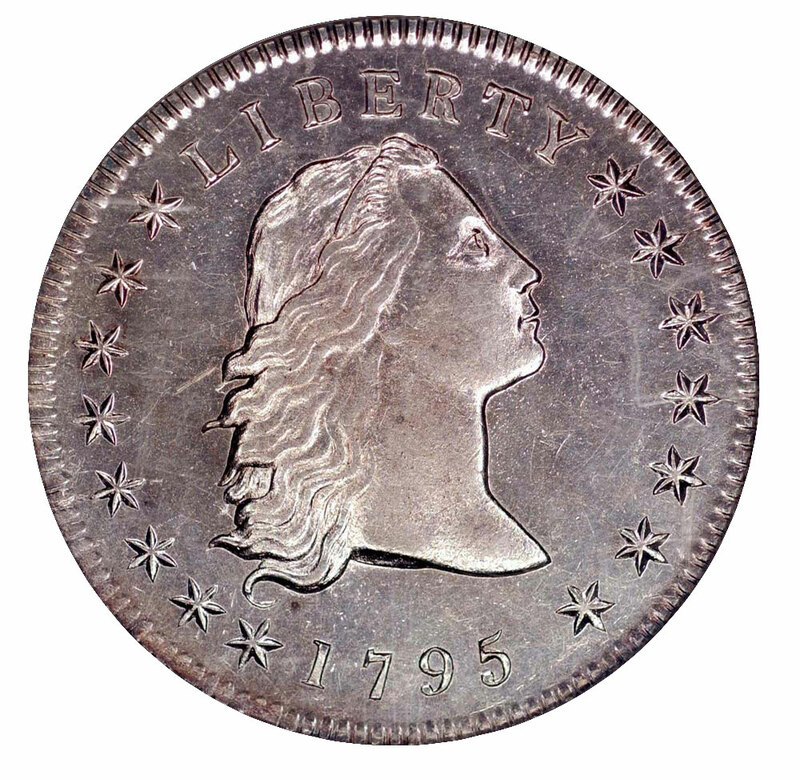 U. S. Mint Engraver Robert Scot created the Flowing Hair silver dollar, and examples were produced only in 1794 and 1795. The former is a famous American rarity, with perhaps 130 or so known today from a net mintage of just 1,758 pieces. Thus, it's not a likely candidate for one's type set. The 1795 dollars are not only far more common and affordable, but they're generally better struck, too. Coinage was suspended in 1794 after it was determined that the existing presses were too small to fully strike such large coins. The 1795 dollars were minted on a larger press ordered specifically for this purpose. The Official American Numismatic Association Grading Standards for United States Coins cautions that "Examples of this design are often weakly struck, particularly on the eagle's breast and feathers." This is indeed the case, despite the adoption of an improved coining press. Sometimes such lack of definition is inherent in the dies, and particular varieties are noted for characteristic areas of weakness. This was due either to the die not being fully impressed in the hubbing process or to a sinking of the die steel as the die was used repeatedly. 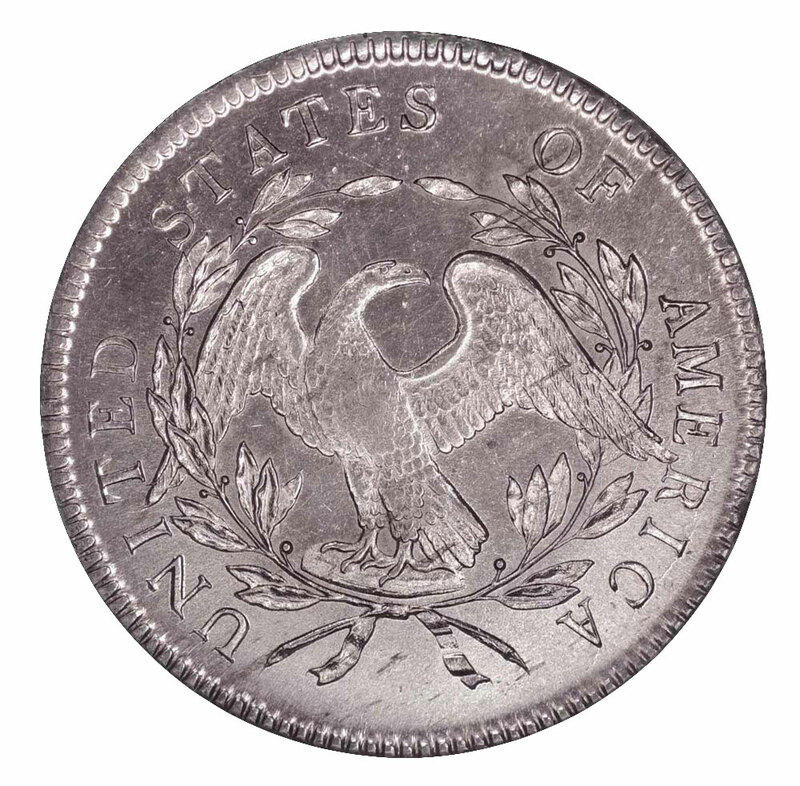 The hardening process for steel was not always performed successfully in the early years of the U. S. Mint, and the coins struck from sunken dies may even appear slightly convex. Another problem with Flowing Hair dollars is that they're often marred by adjustment marks. It was the practice of the mint's adjusters to reduce the weight of overweight planchets by filing them across their faces before striking. The resulting scars appear as distinct troughs on either side of the coin and are most visible on the relief elements, since the depressed portions of the die are the last to fill during the process of striking. Though the majority of surviving Flowing Hair dollars have been cleaned at one time or another, most of these coins have retoned over time. Totally original examples, that is coins that have not been cleaned, are quite scarce. Even so, since 1795 Flowing Hair dollars are not rare in overall numbers, it is still possible to find a nice, original specimen in the circulated grades. Mint state coins are another story. While there are a few such pieces, most collectors will have to be content with a worn example. There seem to be a good supply of these coins in the grades of Very Good through Very Fine, while pieces grading either below or above this box are much more scarce. Given the rate at which silver coins wore, this suggests that the majority of these dollars circulated for only 15-20 years or so. Given the great age of these coins, the grading services are typically more tolerant of flaws such as light cleaning or shallow scratches and rim bumps. While these problems would preclude a more recent coin from being certified, there is some flexibility with regard to these old-timers. Still, a collector should attempt to find a specimen that is well struck, free of deep contact marks or adjustment lines and has either original toning or toning that at least appears natural despite an old cleaning.